The Family Hotel Antibes , 3-star hotel in Riccione, is an annual structure ideal for families with lots of tricks for children. It has a swimming pool, parking, sea-themed rooms and local cuisine with special menus for coeliacs, vegetarians and vegans. It welcomes small and medium-sized pets. 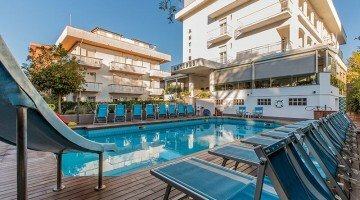 The hotel is located in Riccione near the sea, reachable in a few steps, and near Viale Dante which, with a walk of about twenty minutes between cafes and shops of all kinds, leads up to Viale Ceccarini. The area is well connected by public transport to sports facilities and theme parks, as well as to the center of Riccione and Rimini. All rooms have a balcony, air conditioning, digital terrestrial TV, safe and bathroom with hairdryer and shower. The hotel has different types, all different in furnishing to make the stay more suggestive. CAMERA DELFINO: they are located on the ground floor and overlook the internal courtyard. They have a small terrace, a small balcony to hang out and a minibar on request. CAMERA GABBIANO: they are located on the upper floors and, besides the services already listed, have a small terrace and a minibar on request. STELLA MARINA ROOM: the dimensions are more comfortable and have TV with SKY, and a cradle bed if required. On request they can have a sea side balcony with a private loggia. ULISSE ROOM: this room offers a marine setting dedicated to the Ulysses dolphin of the Oltremare Park. It enjoys the same services as the Stella Marina room. SHARKY ROOM: the interiors are set up to celebrate the star of the Aquarium of Cattolica, the bull shark. The marine representations are especially suggestive for the little ones. CAMERA DINO ROOM: room with themed design on the dinosaurs. Garden, open-air porch, terrace, large swimming pool, free use of bicycles, satellite TV room with Sky and PlayStation room, lift, welcome drink, theme nights, shuttle service to the airport and station. For a fee: laundry service. PARKING: 3 parking areas available, one inside the structure with 10 cars, a fenced 50 meters away and a covered and guarded 24 hours a day and is connected by shuttle service. CONVENTIONS: beach, amusement parks, gym, spa, swimming pool, waterslide, shuttle service. BREAKFAST: international buffet, also served in the terrace above the pool, with homemade pastries, cold cuts and cheeses. LUNCH AND DINNER: 3 local gastronomy menus with meat and fish dishes followed by a buffet of vegetables and appetizers, as well as 7 desserts of your choice. VARIATIONS: menus for coeliacs and vegans are available on request. Every week there is a buffet evening with typical products of Romagna, including piadina, cuttlefish with peas, beans with pork rind, grilled pork, cold cuts, local cheeses and Sangiovese. In the hotel: children's pool, game room with four PlayStation stations, table football table, playground for children from 2 to 6 years, strollers, entertainment and mini club in hotel for children from 3 to 10 years for lunch and dinner, Nutella afternoon party, entertainment evening, dancing games, recreational activities, swimming lessons and pool games. On request: baby sitter and pediatrician. In the room: cribs, copripres, night lights and sides for the rooms. At the restaurant: baby menu (with vegetable and vegetable stock for the little ones, pasta with tomato or meat sauce, fried potatoes, cutlet, slices of meat, ham and cooked for the older ones), meals at early times, high chairs and cutlery, possibility to eat all together with the nanny to socialize with peers and let the parents enjoy their food in peace. The hotel has a heated swimming pool surrounded by sun loungers with a hydromassage corner and a slide for children. The hotel guarantees unlimited entry for the whole family to 2 parks, the Beach Village, a water park with slides and pools directly on the beach, and the Perle water thermal park with sunbeds, beach umbrella and thermal waters also suitable for children. The shuttle service to the parks is free and available all day. The prices of the price list are per person per day in full board and include (from 1 June until 10 September) unlimited free entry to the outdoor thermal park with sun beds and umbrellas and the water park on the sea. TOURIST TAX: not included: € 1.80 per day for the first 7 days only, minors are exempt up to 14 years of age. - Super Pass Antibes: from € 18.00 per person per day. Admission to one or all the Parks of the Riviera.